Two of our graduates have designed the UK’s largest temporary accommodation development – providing emergency accommodation for up to 288 people before Christmas. John Smith and Roman Schneker both studied architectural technology and now run Cityzen, the Sustainable Architecture & Engineering practice in Portslade. 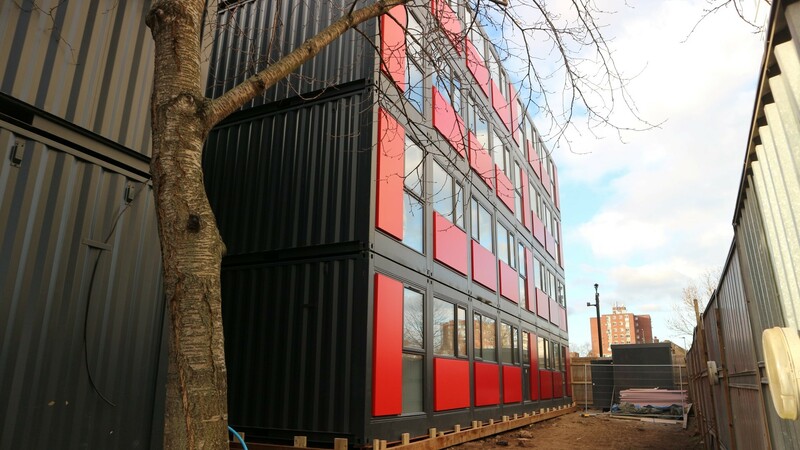 They designed the development reusing shipping containers, for Sussex based developers QED. The 60-apartments delivered in Acton, West London, for Ealing Council include 32 with two bedrooms, 20 with one bedroom and also eight studio homes. Each has its own kitchenette, shower room, and front door. There will also be a management office and laundry unit. The apartments are based around Cityzen’s modular design of one, two and three adjoining units. Cityzen produced 315 drawings and each container build was tracked from the design process, through to the factory construction and to delivery on site. Cityzen designed not only the apartments but the building services in the apartments, and utilities to site. John started out as a building services engineer but was continually being asked to look at the fabric and design of building to improve the performance. He saw that energy and sustainability were coming to the fore in the building industry so in 2003 he moved to Brighton to train at the University. Roman studied the same course at the School of Environment and Technology as he wanted to engage with the science of architecture and how buildings are built. John started Cityzen in 2010 and it became a limited company in 2017. John and Cityzen have mentored six placement students from the University of Brighton. Roman was one of these students and he later joined Cityzen as a Senior Architectural Technologist. For the past year he has been leading technical design on the firm’s modular and housing projects. The Acton development has a seven-year site use lifespan. After that time the units will be dismantled and taken to another site. John said: “The team therefore has had to think not only how to build it quickly, exceeding building regulations, but how will it will then be dismantled and reused. This entry was posted in Construction, News, Student success, Uncategorized.